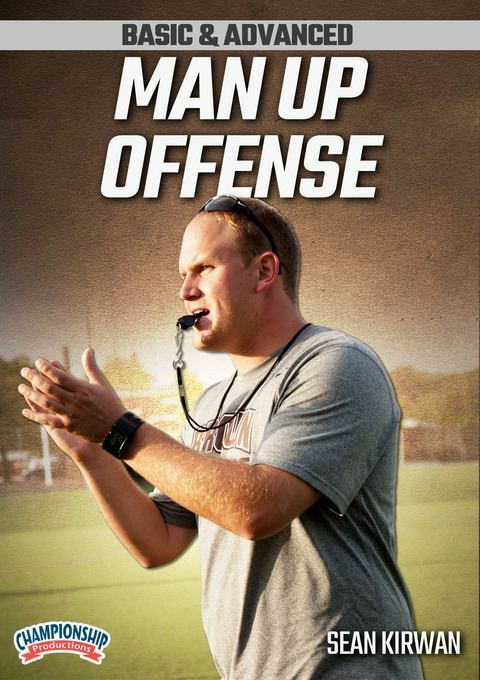 Coach Kirwan presents a step-by-step development of the fundamentals of man down offense and shows more implementation of man up offense against 4 and 5 man rotations as well as special situations like locks and using picks and seals. He begins with a discussion on basic principles of man up offense, explaining that it is more of a mindset and going after the advantage being an extra man. He goes over roles and goes over trigger points to initiate the offense and goes over reads that the man down defense may show and uses movements and actions, such as motion, picks, seals, pop-outs/roll-outs, and carries. Coach Kirwan diagrams on the whiteboard and then implements his offense on the field with his players. He breaks down the video into different phases: basic principles, carries, lock situations, picks and seals, and drills. Attacking against various sets such as 4- and 5-man sets, Coach Kirwan diagrams on the white board using both schemes as well as special situations such as locking crease or shooters. He then takes to the field to demonstrate many of the drills and schemes.